A standard, commercial letter of credit (LC) is a document issued mostly by a financial institution, used primarily in trade finance, which usually provides an irrevocable payment undertaking. The letter of credit can also be payment for a transaction, meaning that redeeming the letter of credit pays an exporter. 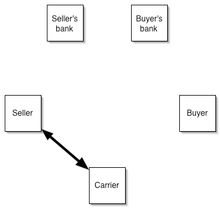 Letters of credit are used primarily in international trade transactions of significant value, for deals between a supplier in one country and a customer in another. In such cases, the International Chamber of Commerce Uniform Customs and Practice for Documentary Credits applies (UCP 600 being the latest version). They are also used in the land development process to ensure that approved public facilities (streets, sidewalks, storm water ponds, etc.) will be built. The parties to a letter of credit are usually a beneficiary who is to receive the money, the issuing bank of whom the applicant is a client, and the advising bank of whom the beneficiary is a client. Almost all letters of credit are irrevocable, i.e., cannot be amended or canceled without prior agreement of the beneficiary, the issuing bank and the confirming bank, if any. In executing a transaction, letters of credit incorporate functions common to giros and Traveler’s cheques. Typically, the documents a beneficiary has to present in order to receive payment include a commercial invoice, bill of lading, and documents proving the shipment was insured against loss or damage in transit. The English name “letter of credit” derives from the French word “accreditation,” a power to do something, which in turn derives from the Latin “accreditivus,” meaning trust. This applies to any defense relating to the underlying contract of sale. This is as long as the seller performs their duties to an extent that meets the requirements contained in the letter of credit. 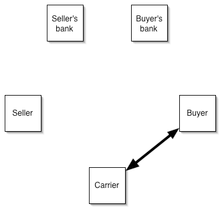 Letters of credit (LC) deal in documents, not goods. An LC can be irrevocable or revocable. An irrevocable LC cannot be changed unless both buyer and seller agree. With a revocable LC, changes can be made without the consent of the beneficiary. A sight LC means that payment is made immediately to the beneficiary/seller/exporter upon presentation of the correct documents in the required time frame. A time or date LC will specify when payment will be made at a future date and upon presentation of the required documents. Policies behind adopting the abstraction principle are purely commercial, and reflect a party’s expectations: first, if the responsibility for the validity of documents was thrown onto banks, they would be burdened with investigating the underlying facts of each transaction, and would thus be less inclined to issue documentary credits as the transaction would involve great risk and inconvenience. Second, documents required under the credit could in certain circumstances be different from those required under the sale transaction. This would place banks in a dilemma in deciding which terms to follow if required to look behind the credit agreement. Third, the fact that the basic function of the credit is to provide a seller with the certainty of payment for documentary duties suggests that banks should honour their obligation notwithstanding allegations of misfeasance by the buyer. Finally, courts have emphasised that buyers always have a remedy for an action upon the contract of sale, and that it would be a calamity for the business world if, for every breach of contract between the seller and buyer, a bank were required to investigate said breach. Letter of credit also refers to FIATA documents. More strictly, in practice freight forwarders usual present FIATA documents and the question is does FIATA documents can use like a document for activating letter of credit. In theory, the question is not very clear, because of the weakness in UPP 600. A few countries including the United States (see Article 5 of the Uniform Commercial Code) have created statutes in relation to the operation of letters of credit. These statutes are designed to work with the rules of practice including the UCP and the ISP98. These rules of practice are incorporated into the transaction by agreement of the parties. The latest version of the UCP is the UCP600 effective July 1, 2007. The previous revision was the UCP500 and became effective on 1 January 1994. Since the UCP are not laws, parties have to include them into their arrangements as normal contractual provisions. For more information on legal issues surrounding letters of credit, the Journal of International Commercial Law at George Mason University’s School of Law published Volume 1, Issue 1 exclusively on the topic. .
International Trade Payment method can be done in the following ways. Subject to ICC’s UCP 600, where the bank gives an undertaking (on behalf of buyer and at the request of applicant) to pay the shipper (beneficiary) the value of the goods shipped if certain documents are submitted and if the stipulated terms and conditions are strictly complied with. A Force majeure risk is 1. a risk in trade incapability caused by a change in a country’s policy, and 2. a risk caused by a natural disaster. 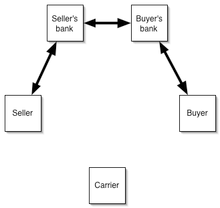 After a contract is concluded between buyer and seller, buyer’s bank supplies a letter of credit to seller. Seller consigns the goods to a carrier in exchange for a bill of lading. Seller provides bill of lading to bank in exchange for payment. Seller’s bank exchanges bill of lading for payment from buyer’s bank. 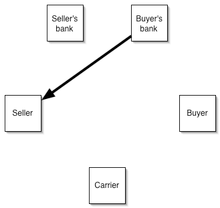 Buyer’s bank exchanges bill of lading for payment from the buyer. Buyer provides bill of lading to carrier and takes delivery of goods.